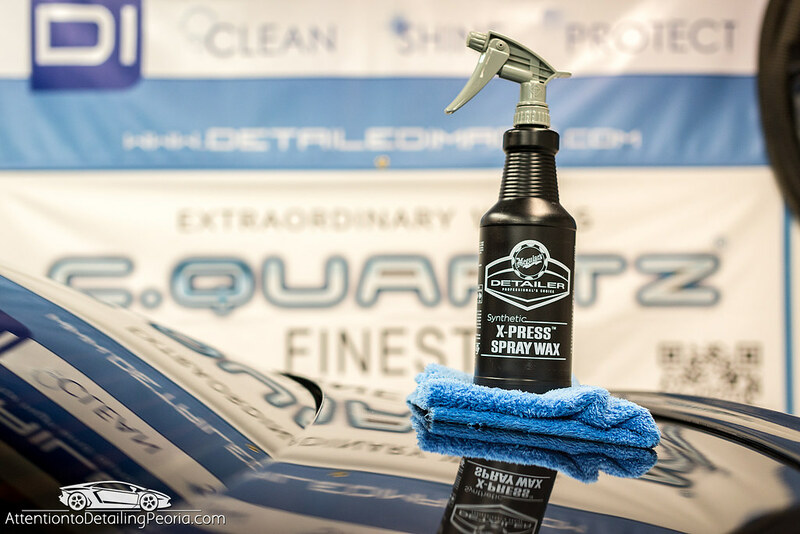 The search for the perfect quick detail spray is perhaps an endless pursuit. A “quick detailer” can mean many different things to many different people. Personally, I don’t use QD sprays for cleaning as I find rinse less washing to be more effective and it feels more safe, so I prefer to save these QD sprays for use as a drying aid or for a post wash wipe down to boost protection, add gloss, increase slickness, and clean up any residual water droplets that I may have missed while drying. I decided to give Meguiar’s D156 Synthetic X-Press Spray Wax a try after reading many satisfied reviews on it. This product is said to enhance gloss and protection, while also being easy to use… sounds like a winning combination. I have used this product on both wet and dry surfaces, and have been very pleased in every instance. I typically mist the product onto a damp panel as I am drying, and then wipe it off with my drying towel. D156 adds noticeable slickness and wipes away easily without streaking or smearing. As with most quick detail spray, less is more, so you only need a light mist of product onto the panel. It took me no more than 10 minutes to go over my own cars, and the end result looked great. Very little effort, no mess, and a great shine. If you’re looking for a great quick detailer that is effortless to use, looks great, and helps to boost the appearance and protection of your vehicle, Meguiar’s D156 may be just what you need. It is sold in a 128 oz (1 gallon) size and is a ready-to-use (RTU) product, therefore no dilution is required. I also highly recommend picking up a Meguiar’s D156 spray bottle and chemical resistant sprayer to go along with it. Hello Zach, I have use ultimate quick wax, which is supposed to be the consumer version of X-Press Spray Wax as an drying aid, and it really makes drying easy and the shine its spectacular, used in a performance blue 2014 focus ST =). Great review as always. I didn’t know you could use in wet like that. In your experience, what can we expect in terms of durability? 1 week? 1 month? Let’s say average weather conditions on a daily driver. Yep, I use it on a damp car most often… just mist it onto the panel before you dry and wipe it away. I honestly don’t know as far as durability goes. I wash my car every 1-2 weeks and usually reapply as I dry since it is so easy. My cars are all coated so they bead like crazy anyways, so it is difficult to tell if/when the D156 has worn away. I’ve seen others estimate ~2 weeks of life. Thanks for reading! SO…what exactly is the difference between D-156 Synthetic X Spray Wax and Meguiar Ultimate Spray Wax? It’s my understanding that neither has any Wax. Thanks for the review Zack, it really boosted my confirmation bias. Of course I already have known about D156 and have been using it for a while now but it’s nice to hear when a pro as yourself finds it to be a great product too. Kinda let down though as you didn’t speak much to it’s versatility as it is a spray wax but will not stain/chalk black trim or glass. It can also be used on every interior surface except carpet and fabric upholstery, To me it it’s the ultimate quick detailer, spray wax, and conditioner as it can be used on the entire exterior and most all of the interior of any vehicle. 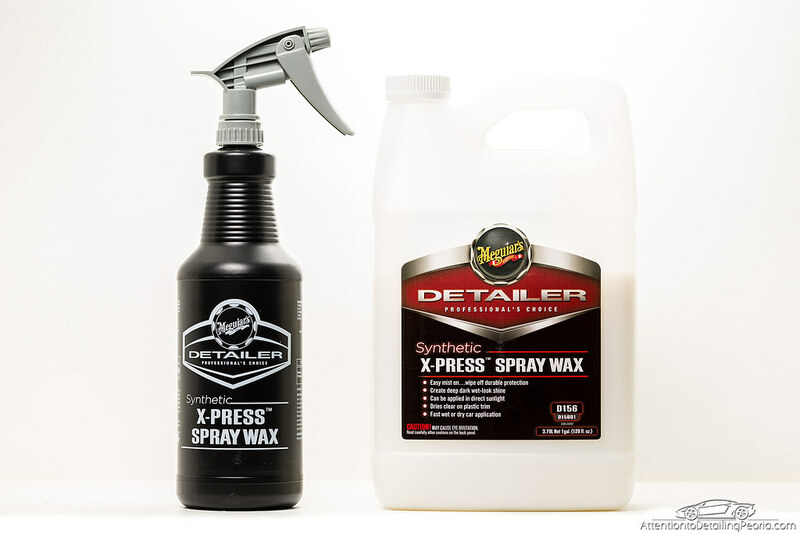 Given the incredibly low price, it can easily replace several products on a detailer’s shelf. Do you plan on ever doing a spray wax/detailer comparison? I’d like to see how D156 holds up, but again I’m pretty set on this awesome product and would probably continue to buy it no matter the results. Thanks for sharing, Christopher. I personally only use it as a spray detailer on paint. I would love to do a quick detailer comparison, but it is hard to find a test subject that I can monitor over an extended period of time. My personal vehicles are all coated and therefore wouldn’t be easy to distinguish the performance of a spray detailer. How does this compare to M135? Same hydrophobic properties? Sorry, I have no experience with M135. Zach, I’ve seen several videos on YouTube showing the capabilities of this wax (polymer). From what I can see it can be used on just about everything on or in a car. I’m pretty convinced this wax will do the job of at least three products that I have. I believe that most people will still use a wheel cleaner and a tire shine but other than that this wax appears to take care of the rest of the car. Thanks for your review. I would like to see a video from you on this product. Hey Joe – I’ve used it on paint (obviously), glass, plastic trim, wheels, metal, and even interior pieces! This stuff does a great job on all kinds of surfaces. I’ll see if I can find the time to do a more in depth video some time later this year. Thanks for the comment! Just used this for the first time and it left my windows streaky and I had a tough time getting it off. May have let it dry, not sure. Did not spray directly on the windows, just overspray, and did not expect this challenge given the product description. Did not have this trouble with Griot’s Spray Wax. What did I do wrong? Hi Darryl – this product should be effortless to use when used properly. The trick with this and most quick detail/spray wax products is to use very little product. If you use too much, it may become difficult to wipe away cleanly. We use just one light mist of product per small panel (door) or a couple per large panel (hood) at most. If you notice some dried over spray like you mentioned, simply wipe it away with a damp towel. 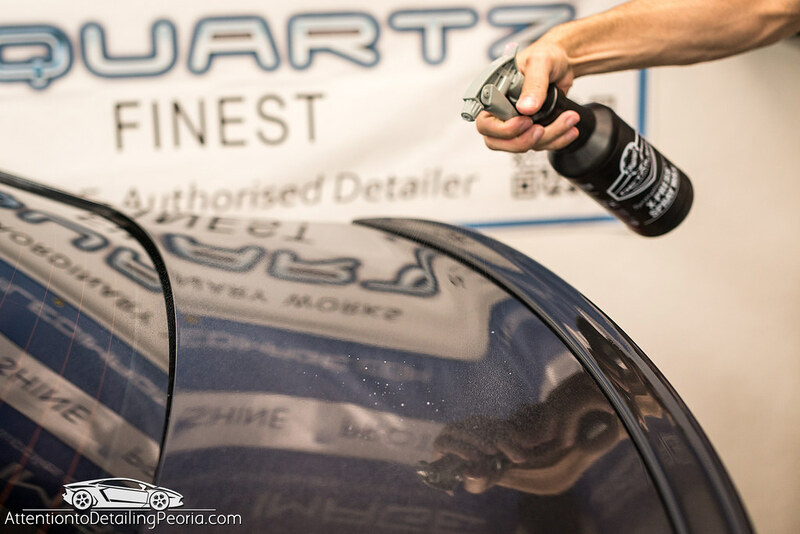 Zach – what is your preferred coating on your vehicles? Hey David – We’re fortunate enough to be asked to test many products… coatings included, and over the years I have come to find that most coatings will perform amazingly well when used properly. So in terms of performance, there is really no wrong option in my option… they will all out perform any traditional wax or sealant by a long shot. When it comes to application, they can vary greatly. I personally love all of the 22ple products for their ease of use. GTechniq Crystal Serum Light & Optimum Gloss Coat are also very user friendly. Let me know if you have any other questions! Zack,I just waxed my car, would d156 be a product to use weekly to ”keep up the wax” ? Absolutely! D156 will add some additional protection and help to maintain that glossy finish after each wash. I like to use it as a drying aid by spraying the product onto a damp car right before drying it. Hey Zach, a little late in this conversation, but I also use D156. I don’t have much experience with other spray waxes to compare, but i have been happy with D156 results. I use D156 just as you do, applying to wet panels as a drying agent after each wash (I wash once every week or 2). I also use Meguiar’s Ultimate Liquid Wax about every 3 months. Will this schedule of paint protection be enough to protect my exterior from normal driving conditions? I was really trying to keep things simple without necessarily using ceramic coatings and such. Hi Gabe, there is no perfect formula for paint protection, but what you are doing sounds great for an easy approach to keeping your car looking great! Ceramic coatings have their own specific benefits, but the car care industry was getting along perfectly fine without them, so don’t feel like a coating is a necessity. Keep it up! Thanks for your response Zach!! What I have started doing is not only using the D156 on my wet car as a drying agent, but also reapplying it after the car is dry for a final buff. It seems silly, as it is probably all in my head, but I really do think my car has an extra level of pop, shine, and slickness. I’m stopping there though (no 3rd or 4th application as that is obviously ridiculous, ha!). … as long as your car looks great, keep doing what you’re doing! Have a good weekend. I am William Collins ,I would like to Register 2-Cycle Biodegradable in your company and also i would be happy if you can get back to me again with the prices and dimensions you having available in a moment,and also do you take all types of Credit Cards as your payment required?Kindly get back to me here or on phone so that we will work together as one panther. All the best and stay blessed….